Sea ice was a key factor in the development of the Viking immigration into Greenland and the ultimate demise of their settlements. The Vikings sailed from Iceland and first settled in Greenland in 981. They developed pasture land and farms on the western Greenland coast. However, in the harsh environment, they were not self-sufficient and required supplies, which were transported from Norway and Iceland across the sea. This was a relatively warm period of history, and sea ice was uncommon in the trade route between Greenland and Europe. By the 1300s, the climate had turned much colder. —Photo courtesy of the National Oceanic and Atmospheric Administration/Department of Commerce. Trade decreased with Norway, partly because of political and economic factors in Norway, but also because of the increasing sea ice, which made transoceanic travel more costly and dangerous. After the early 1400s, contact was completely lost with the Greenland Vikings. When the next European ship sailed into the region almost 150 years later, the sailors encountered no surviving settlers. While the colder temperatures affected the Vikings primarily through lower crop yields and a stressed food supply, increased sea ice likely had some effect by cutting off the delivery of necessary supplies from mainland Europe. Sea ice has played an important, and often tragic, role in the exploration of the polar regions since the 1500s. Initially, Europeans were interested in finding the "Northwest Passage," a hypothetical sea route through the Arctic from Europe to Asia. The Europeans thought that if they found such a route, it would lead to a much faster voyage because the distance was so short between Europe and the Arctic. But the arctic sea ice stymied many attempts from the 1500s through the 1800s. It wasn't until 1906 that the Northwest Passage was finally successfully navigated by Roald Amundsen, a famous Norwegian polar explorer who also led the first expedition to the South Pole. Navigation through the Northwest Passage was a difficult voyage and took Amundsen and his crew three years to complete. Sea ice was also an important factor in attempts to reach the North Pole, which is situated in the middle of the Arctic Ocean and is covered by sea ice the entire year. Initially, some explorers believed that enough open water existed for a ship to navigate to the North Pole. This led to the ill-fated Jeannette expedition, led by the U.S. Navy in 1879. The Navy believed that warm ocean currents flowed from the Pacific Ocean into the Arctic through the Bering Strait between Alaska and Russia, maintaining ice-free waters all the way to the North Pole. However, this was not the case, and the Jeannette quickly became stuck in the sea ice shortly after passing through the Bering Strait. It drifted with the ice for two years, but in 1881, the ship was crushed by the shifting sea ice, and the crew was forced to abandon it and try to reach land over the ice. During summer, the ice broke apart before the crew reached the Russian shore, and they jumped into three small life boats they had dragged with them. One boat was lost in a storm. Of the other two, one landed near a village, and those crewmembers survived. The other unfortunate life boat landed in an isolated region, and those members did not survive, likely due to starvation. The Fram was designed so the force of the ice would push the hull upward and the ship could sit on top of the ice. Robert Peary in the Arctic observing tides for the U.S. Coast and Geodetic Survey during a North Pole expedition. 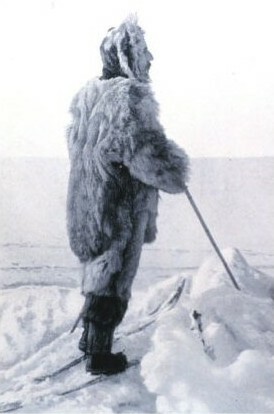 Peary is usually credited as being the leader of the first expedition to reach the North Pole. Peary entered the U.S. Navy in 1881 and remained in the service until retirement, taking periods of leave for Arctic exploration throughout his career. Fritjof Nansen, a Norwegian, took note of the Jeannette tragedy. He realized that a ship couldn't sail to the North Pole but might reach it by drifting with the ice; however, the ship would have to be built to withstand the crushing force of the sea ice. The answer to Nansen's quest was the Fram. The Fram was built and launched in 1892. Its strong hull was specifically designed so that the force of the ice would push the hull upward, leaving the ship to sit on top of the ice. 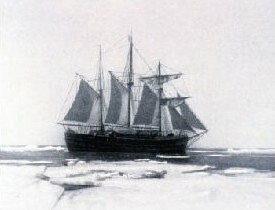 From 1893 to 1896, the Fram drifted across the Arctic, trapped in the sea ice. This experience confirmed that sea ice has a large-scale (hundreds of kilometers) circulation and moves across the entire Arctic. Ultimately, the drifting sea ice failed to take the Fram over the North Pole, reaching only 85 degrees, 14 minutes latitude. On March 14th, 1895, Nansen and a companion left the ship with dogs, kayaks and sledges, making a desperate bid for the Pole. Their progress was pitifully slow, and the conditions were worse than expected. Finally, at 86 degrees 14 minutes north, the closest to the Pole any man had come, they decided to turn back. Despite its failure to achieve its ultimate goal, the Fram expedition reached farther north than any other ship before, and farther than any other surface ship to date except for Russian nuclear-powered icebreakers. Americans Robert Peary and Matthew Henson, along with several Inuits, were the first people to finally reach the North Pole. They arrived on April 6, 1909, by traversing across the sea ice on dog sleds. But were they really the first? 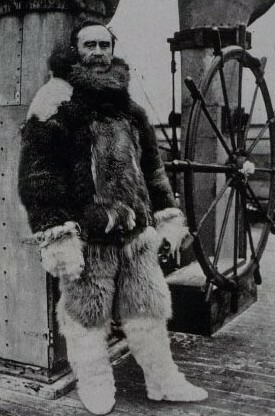 Another American, Dr. Frederick Cook, claimed his expedition reached the North Pole on April 28, 1908. The Peary and Cook groups both had conflicting details in their stories, and neither group could provide definitive proof that they were first. Sea ice is one reason for the conflicting stories. No flag or other marker placed at the North Pole can stay for long. Drifting sea ice will move any marker away, and shifting ice would eventually destroy the marker. Most historians now believe that Cook's claim is false, because a map of Cook's route showed that instead of going to the North Pole, Cook had gone only a short distance to the northwest on the Arctic Ocean before turning back. But because of the missing marker, we will never know with complete certainty who reached the North Pole first, or if neither of them did.